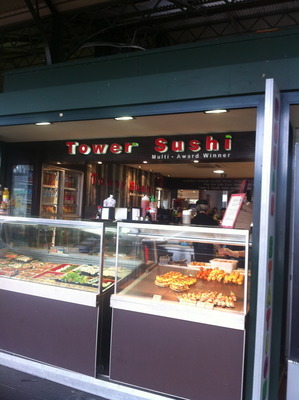 Tower Sushi on Swanston Street at Flinders Street Station opposite Federation Square in all seriousness has the freshest sushi, and the taste just matches this freshness. The rice isn't too grainy, it is soft with a great texture and aftertaste. Any of their fish varieties, even trying the crab with avocado and lettuce was just divine and made for a great morning snack, and even just as great for lunch. And their miso soup for $1.95 appears to be on the cheap side, yet do not underestimate this soup as it is just divine and does not taste like it has just come out of a packet. For $2.20 a roll, great value is to be enjoyed. 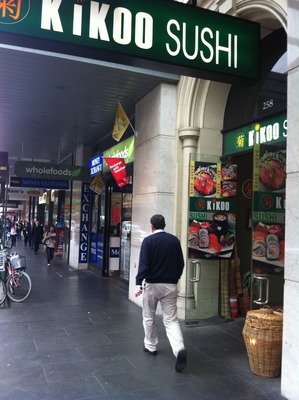 Kikoo Sushi on Flinders Street has a choice of delicious sushi, and their raw salmon and tuna varieties are divine. Expect super efficient service. 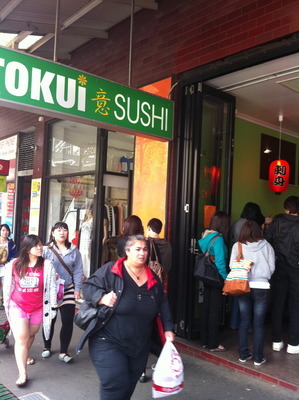 If you happen to be anywhere near the QV Centre, then a visit to Tokui Sushi for some $2 sushi rolls should not be taken off the agenda. Although a small eatery, it is chic and comfortable and their sushi products are really of high quality. Great flavours and taste. Otherwise head into the QV Centre and try any of the sushi establishments there if you like a lot of rice with a generous amount of filling. Any of the chicken teriyaki sushi rolls at any of the sushi establishments in the QV Centre makes the whole experience worth it. You might ask about the sushi trains. The hunt is still on to find the best sushi trains in Melbourne. Cost: Depending on sushi rolls ordered: anywhere from $2-2.50 per roll. All the above sushi shops are pretty average. My favorite and the BEST sushi shop In town for me and quiet a few people cause there is always a massive line and u at least have to wait 10mins ( worth it's wait) is Sushi Monger hidden in one of the lane-ways in between bourke st & little Collins.